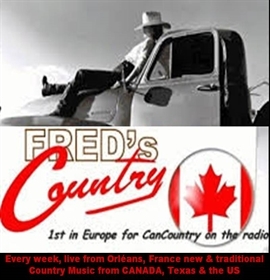 Fred's Country, the best of contry music with Fred ! Each thursday 7h00-8h00pm (french time). The sunday live morning show 10h00 - 11h00am (french time) with Patrick ! All the best music you love, and your dedications. Call to +33 4 69 66 57 36 (then press 3) to ask for your favorite song ! And of course during the week, your chronicles "Book of the day", "Video top", your french TV programs, and the Ephemeris !